Afternoon dresses by Jeanne Lanvin 1915. Robes d’Après Midi. 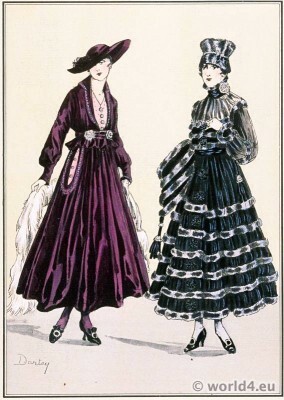 Modèles de Jeanne Lanvin. Left: Dress of plain claret velvet. Waistcoat and edging of the pockets in pink cloth. Silver embroidery at the collar, wrists and pockets. Cockades in silver ribbon; round silver buttons. Hat from Lanvin to match. Right: Afternoon dress in black crimped crape trimmed with mole. Cockades of narrow faille ribbon arranged from top to bottom along the front. The bands of mole are placed in circles on the skirt and on the bodice, nearly under the arms. They also form epaulets. The gathered sleeves, widened as the elbow are transparent over the arm. Big soft muff to match. Hat from Lanvin`s in mole. Gallery: Le style parisien. Plate I. Supplément du ” Style Parisian ” No 3. Le Directeur – Gérant: Lucien Vogel. This entry was posted in 10s, 1915, 20th Century, Art Deco Period, France, Haute couture, Le Style Parisien and tagged Haute Couture Costumes, Jeanne Lanvin, Lucien Vogel on 8/3/14 by world4.